JOHANNA HJERTBERG lives in Stockholm, Sweden, where she’s studying industrial engineering and management. When she’s not studying, she loves to ski, sail and windsurf! 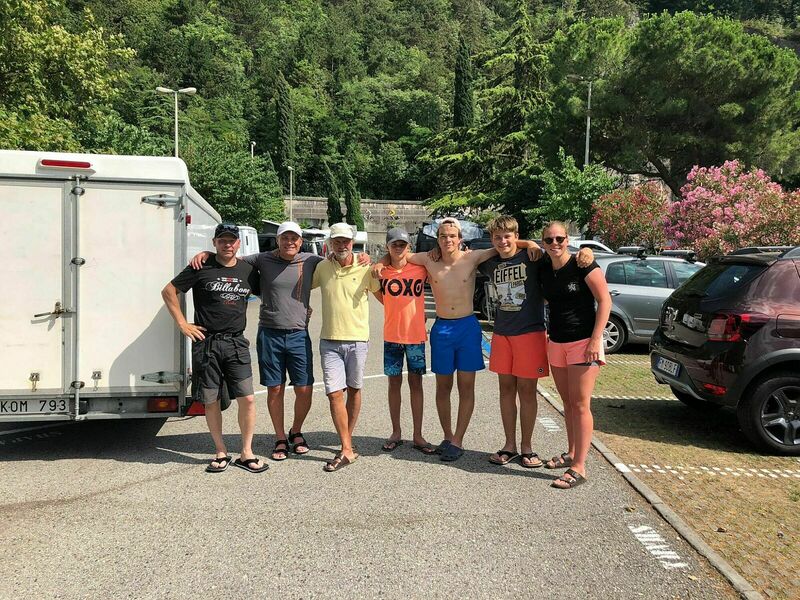 A few weeks ago, she hit the road with family and friends and made her way to Lake Garda in northern Italy, a nature wonderland for sports enthusiasts and one of the top windsurfing destinations in the world. Their plan? Sail their Konas as much as they could and enjoy everything else that the region has to offer! Every day I stopped what I was doing for a few minutes to simply soak up the natural beauty! Story: Johanna Hjertberg | Photos: Johanna and friends. My name is Johanna, I’m 20 years old and I’ve been windsurfing for three years now! 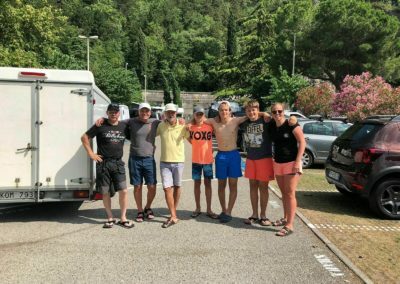 I have a lot of Kona friends in Sweden, and a few weeks ago, we decided to take a trip to Lake Garda in Italy and spend a week windsurfing there on our Konas. There were twenty of us in the group, and we had an amazing time! Some booked a flight to get there, but with my dad and my sister, we decided to go by car. 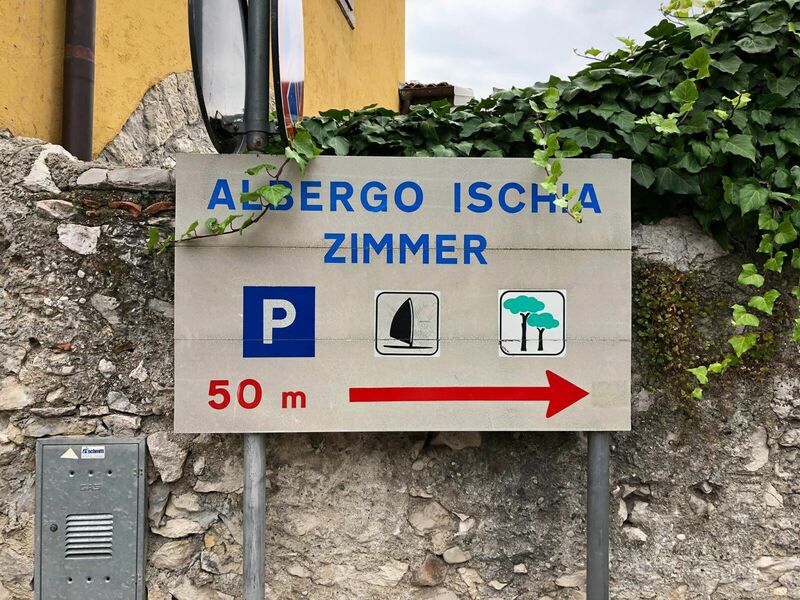 In our family, we really enjoy driving around Europe, and we looked forward to spending time on the road as a family. But first, we had to make a couple of stops to collect all the gear that the group would get to use in Italy. First in Motala, then in Hittarp, we gathered a grand total of 13 boards and even more rigs! Only 11 boards fit in the trailer, so we loaded the other two on top of the car and we were all set for the long drive ahead. My dad, Carl, is a sailboat racer but he used to windsurf back in the 80s. Then a few years ago, at a sailing event, he bumped into some Kona windsurfers. He had meant to get back into windsurfing for a while, and he jumped at the opportunity. 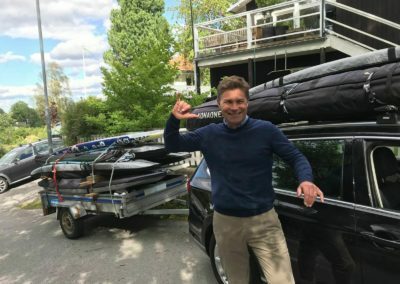 He bought a Kona board and started to windsurf in Aludden, on the Swedish coast a bit north of Stockholm. Maybe a year later, I gave it a try too and I found that it had more action and was more physical than the sailing I was doing at the time, so I started as well. One of the big reasons why I started was that I could sail with my dad. Isn’t that why many of us are sailing Kona? We can be out on the water and compete together with our friends and family. 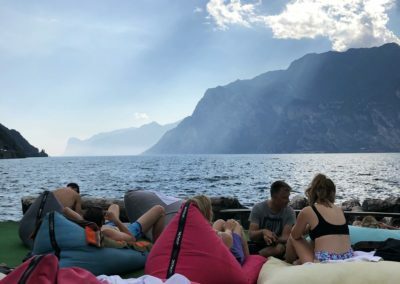 We drove from Hittarp to Torbole in one go. 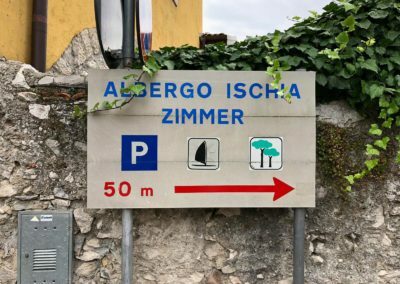 It took us 24 hours, partly because we had the trailer to tow, but also because there was a lot of traffic at the Brenner Pass – the border between Austria and Italy. 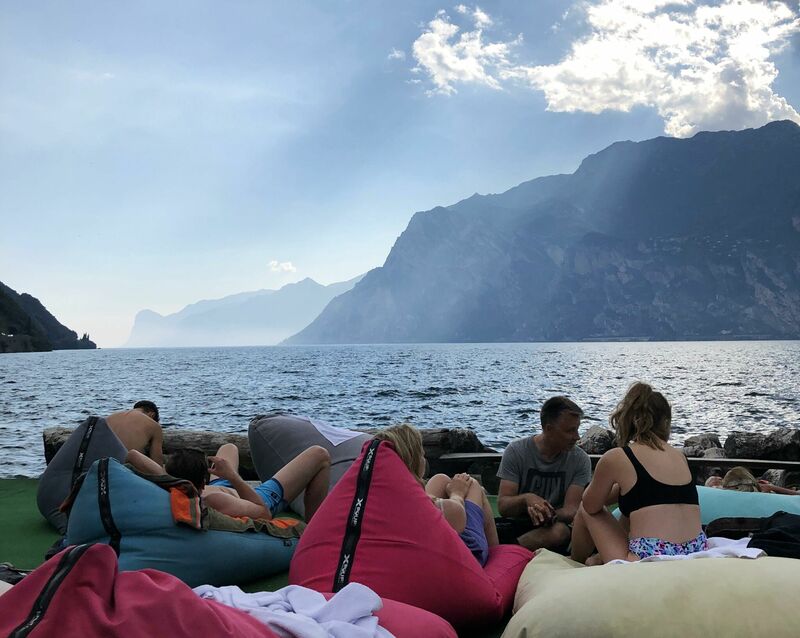 Our destination was the village of Torbole, at the northern edge of the lake, and the first thing that hit us on the way down to the village was the beautiful view of the lake opening up in front of us. 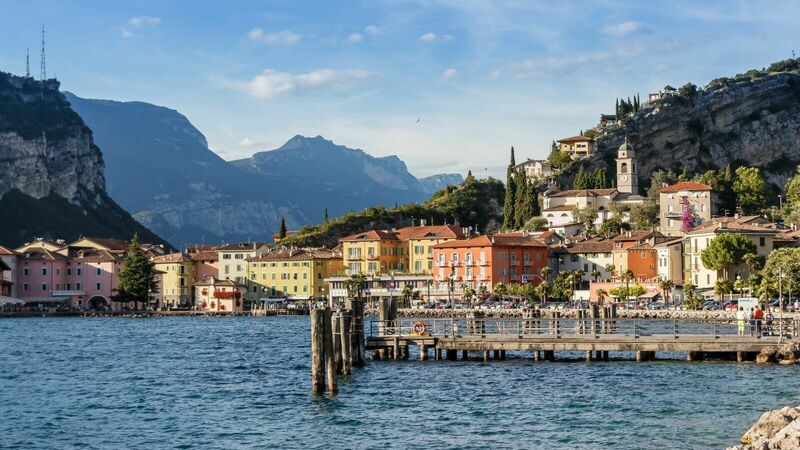 With the mountains all around and the colorful houses everywhere, Lake Garda is really gorgeous. Every day I was there, and several times a day, I consciously stopped what I was doing for a few minutes to simply soak up the natural beauty and atmosphere of this special place on Earth. Our base of operation for the week was the Shaka Center just south of town, and we found it in no time. We parked the trailer there and went to an Italian restaurant for dinner. The first of many, many excellent Italian meals that week! When there is wind in Garda, the lake is full of windsurfers. It’s a really cool scene because the lake is quite narrow there, and thus as soon as the breeze blows, it’s immediately crowded with hundreds of windsurfers. 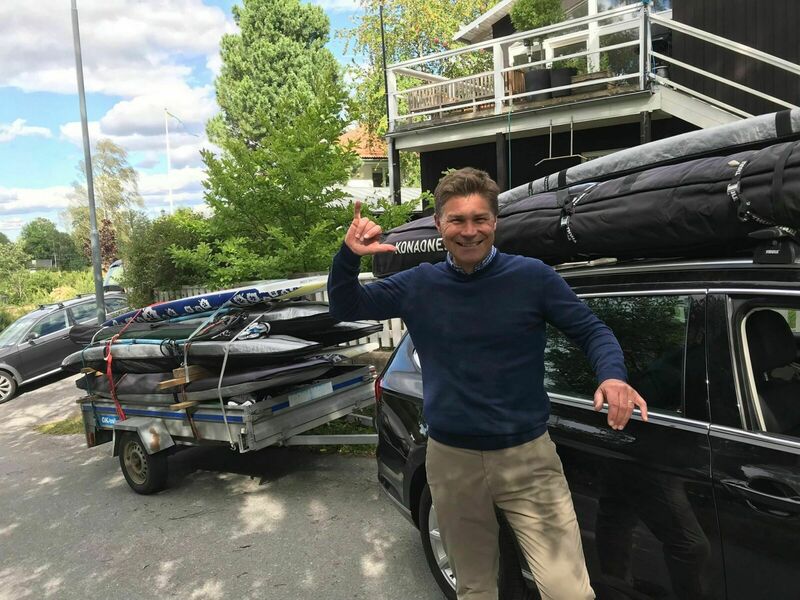 Our friend Joachim took time to count one day and there were 500 windsurfers on the water, half of them beginners! But it’s not windy every hour of the day on the lake. If you get up early, you have a northern wind coming down from the mountains, called the Peler. Then it’s completely still for several hours until the southern wind – the Ora – arrives at lunch. Almost every day we were there, the Ora was strong and we had a lot of breeze to sail in! That ‘wind clock’ made it possible for us to do other things as well. 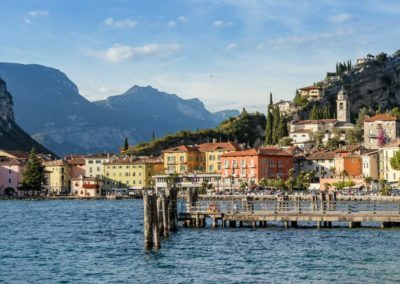 Another sport that’s quite popular around Lake Garda is cycling. One day, when there wasn’t much wind, we cruised the nearby mountains on mountain bikes. 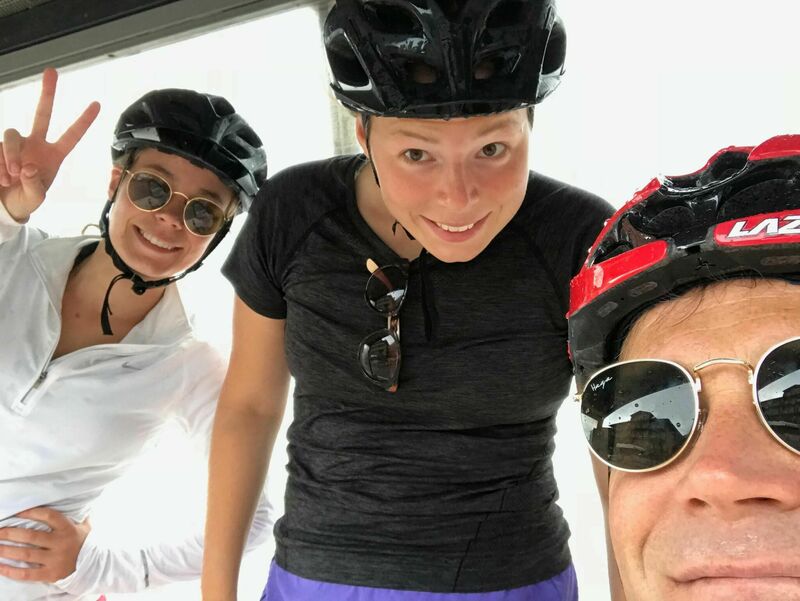 If you want, you can take a lift up to 1800 meters and just bike down for three hours! We also did simple things like SUP, jogging or just sightseeing. Everything was an adventure. We hated packing up the trailer and leaving at the end of the week, but I promised myself that I’d come back and do it all over again!